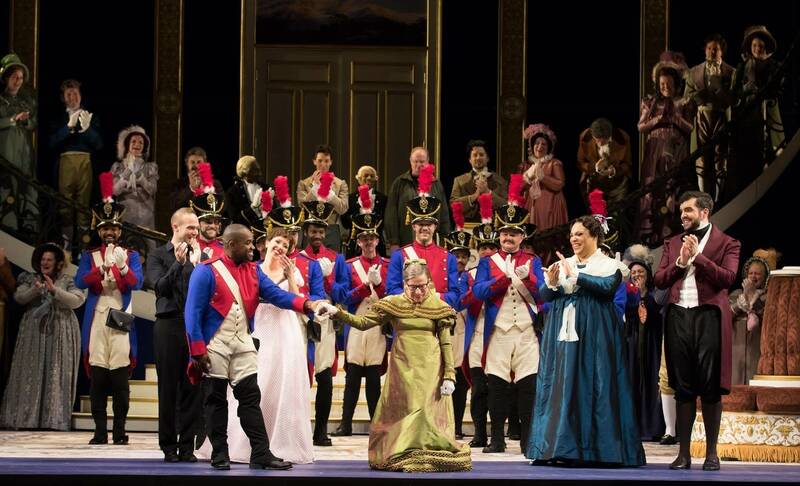 Ruth Bader Ginsburg's operatic debut, in the speaking comedic role of the Duchess of Krakenthorp in Donizetti's The Daughter of the Regiment, had been planned for some time. What Ginsburg likely didn't guess, if her expectations were in line with those of most people watching the polls leading up to last week's election, was that she'd be making that debut as Donald Trump prepared to assume the presidency. It's relevant because at least one of Ginsburg's lines, which she wrote herself in cooperation with Washington National Opera dramaturg Kelley Rourke, seemingly satirized Trump's false suggestions that President Barack Obama wasn't born in America. "We must take precautions against fraudulent pretenders," said Ginsburg in character as the Duchess, asking whether the opera's heroine Marie could produce a birth certificate to prove her lineage. Another of Ginsburg's lines that was rapturously received by the Saturday night audience at the Kennedy Center was, "The best of the house of Krakenthorp have open but not empty minds. The best are willing to listen and learn. No surprise, then, that the most valorous Krakenthorpians have been women." Sharp-eared observers noted that Ginsburg also quoted from one of her own Supreme Court opinions — her dissent in the 2013 decision to weaken the Voting Rights Act — when her character warned against "throwing away your umbrella in a rainstorm because you are not getting wet." Ginsburg is a longtime opera fan, and although Saturday night marked her first speaking role, she's made onstage cameos a few times before — including a joint appearance with the late Antonin Scalia in a 1994 performance of Ariadne auf Naxos, and a 2003 performance of Die Fledermaus at which she was joined onstage by Anthony Kennedy and Stephen Breyer. Saturday night's performance was a one-off; the role will subsequently be assumed by actress Cindy Gold. The audience "roared with love at the curtain call, which she took after all the other performers," reports Anne Midgette of the Washington Post, "dropping, as she did so, a most elegant little curtsy."